A mid-century modern bar chair, the Zip Bar Chair from Zuo Modern pops in any contemporary or traditional setting. 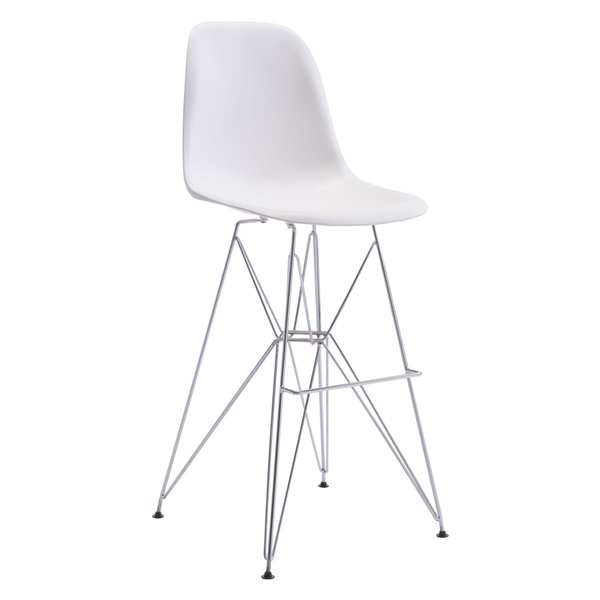 This deluxe bar chair includes a molded ABS plastic seat and back for exceptional comfort. Plus, the chair's slim sphere-style chrome base and black feet deliver outstanding support. For those who demand the best from their bar chair, you can choose the Zip Bar Chair, a seat that will serve you well for years to come. Boasts a mid-century modern style that gives the chair a one-of-a-kind appearance. Features a molded ABS plastic seat and back for exceptional comfort. Includes a slim sphere-style chrome base and black feet that deliver outstanding support. Stunning chair makes a bold statement in any modern or retro setting.